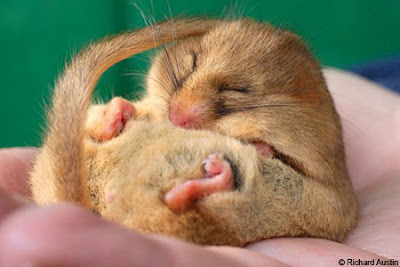 It's a sleepy dormouse--just like the one in Alice in Wonderland. See another pic here. "Once upon a time there were three little sisters," the Dormouse began in a great hurry; "and their names were Elsie, Lacie, and Tillie; and they lived at the bottom of a well--"
That is soo cute!! X3 Love Dozey!! Now, Ananka, stop distracting us. We all know you have a disturbing/interesting/GROSS (or all of them) post up your sleeve... *braces myself* BRING IT! Oh, that's so cute-it says they have to triple their weight in order to survive. A bit sad, but I can imagine the little balls of fur stuffing their faces so they can become fat balls of fur! Heheheh. i've now got a blog!!!! Oh, cute mouse :) It looks kind of like one of the twenty-three dwarf hamsters my sister and I used to have. Here's some stories you might find interesting. Hey SA, I found and read you blog, but I couldn't comment I think 'cause it didn't look like you could comment unless you had a blog. :( How do I comment?! Girl: I LOVE your profile. That is officially one of the cutest mouse pictures that I had ever seen ... its little pink feet are just...eeeeeeeee. Sooooo adorable! Girl: Wow, your profile really IS awesome. I'm going to have to break out the detective skills and find your blog. Girl, I'll must find your blog! =0 omigawd!! !so flippin cute. eeeeeeeeeeeekkk!!!!!!! his lil toes are all...eeeeeeeeeeeekkk!! !so cute! I LOVE the one with him in the coconut! That also cracked me up. I have always love Alice in Wonderland. The book, the disney movie, the one with humans from the 1980's. I always wanted to be Alice and find what she found in wonderland. He is oh so cute.